MAKE YOUR NEXT VOLUNTEER TRIP COUNT BY JOINING ONE OF OUR PROGRAMS AND BECOME PART OF A WORTHWHILE CAUSE IN SRI LANKA TODAY! Sri Lanka is located just off the Southeastern tip of India in the Indian Ocean. It is a tropical island nation that has a history dating back to the birth of time and its scenery is breathtaking. It is a place where the original soul of Buddhism still flourishes and where nature’s beauty remains abundant and unspoiled. There are few places in the world can offer a traveler such a remarkable combination of stunning landscapes, pristine beaches, captivating cultural heritage and unique experiences within such a compact location. 8 UNESCO World Heritage Sites, 1,330 kilometers of pristine coastline, 15 National Parks showcasing an abundance of wildlife, close to 500,000 acres of lush tea estates, 250 acres of botanical gardens, 350 waterfalls, and at least 25,000 bodies of water. Sri Lanka is an island of magical proportions, once known as Serendib, Taprobane, or best put as the ‘Pearl of the Indian Ocean’ and Ceylon. Environmental Issues in Sri Lanka include large-scale logging of forest, degradation of mangroves, coral reefs as well as soil erosion. Among these problems the air and water pollution are also challenges for this country since both air and water pollution can cause significant health risks. Insufficient waste management (especially in rural areas) is a contributing cause to environmental pollution. Sri Lanka is also vulnerable to climate change impacts such as extreme weather and sea levels rising. If that’s not enough, Industrialization and rapid growth are major contributors that lead to environmental issues. A lack of public awareness and government guidelines continues to complicate the problems. 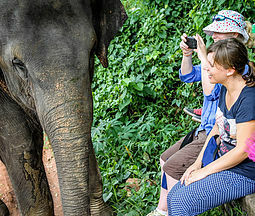 We offer two programs in Sri Lanka that allow you a once in a lifetime experience to get up close and personal with Sri Lankan Elephants or Sea Turtles. As a volunteer, you will have a unique experience to join a team and get involved with the local community, work closely with the local people and join efforts to improve education. By coming to Sri Lanka, you will also get the ultimate educational experience by learning about our planets incredible marine and wildlife and promote the importance of Wildlife and Marine Conservation efforts to all those you come in daily contact with. WEATHER AND CLIMATE: The climate is tropical and consists of distinct wet and dry seasons. The dry season is between the months of December to March. The Yala monsoon brings abundant rainfall to the country’s western and southern regions between the months of May to September. The Maha monsoon affects northern and eastern regions and often occurs between the months of October to January. There is also an inter-monsoonal period between the months of October to November during which rain and thunderstorms occur frequently across the island. The upland areas of Sri Lanka are cooler and more temperate, with a yearly average between 16 - 20 ºC / 60 - 68 ºF. The coastal areas are warmer with an average temperature 27 ºC / 80 ºF. During the months of March to June, tempreatures are slightly higher with an average of 33 ºC / 92 ºF, while during the months of November to January tempreatures are a few degrees lower with an average of 24 ºC / 75 ºF along the coast. This program offers volunteers the opportunity to work closely with the Sri Lankan Elephants in Kegalle. The program began in 1999 and has been working continually to improve the care, protection and treatment of Elephants in Sri Lanka by providing a place of sanctuary and medical services and facilities. The program has provided care to more than 60 elephants over the years. At present, 3 female and 4 male Elephants ranging in age from 17 - 60 years are either temporarily or permanent residents here at the Sanctuary. The aim of the program is to increase awareness about the plight of the Sri Lankan Elephant and to find ways to generate funds necessary for the Elephant's long term care. This sanctuary actively welcomes visitors and if you enjoy elephants and if you are passionate and desire to learn more about these majestic creates and work with them one on one, then this program is a dream come true. volunteers play an important role of contributing to the daily stability of this program. We welcome volunteers from all walks of life, all over the world, with all kinds of skills and/or interests. The main focus is the daily care and management of our Elephants. Upon arrival, you will be allocated an Elephant and will be required to provide the necessities of daily care and treatment. Working under the direction of your Elephant's trainer, you will be required to assist with its feeding, bathing and grooming throughout your stay; and hopefully build a special relationship with your Elephant. As you get to know your Elephant, you will start to recognize its sounds and movements, and get to know its moods and feelings, its individual traits and its temperament. You will also learn to discern the signs and symptoms of possible approaching sickness. This requires dedicated care and responsibility. Volunteers must be able to work independently within the guidelines of the project. Patience and perseverance are essential, enthusiasm and a willingness to accept other cultures different from their own will will allow you to get the most from your volunteering experience. During your placement, you will be required to use your initiative to develop your own ideas and follow up those of previous volunteers. We are here to help you work towards improving the sanctuary and the health and well being of our elephants. As a volunteer, your duties may include the following: providing care and conservation at the center, teaching English, ecological farming and/or mobile Veterinary unit. PLEASE NOTE: If you are planning to continue volunteering on this program longer than one month, you will be required to extend your visa and there will be additional charges that you will be responsible for. This program provides an opportunity for those who are interested and have a drive to help protect the oceans precious sea turtles. The truth of the matter is that our planets' marine life is diminishing rapidly and its up to us to understand the growing concern and educate others in trying to prevent it before its too late. Getting involved in marine conservation is a very hands-on experience involving beach conservation work, maintenance of the turtle hatchery, turtle feeding (and cleaning) and even taking tours around the project for locals and tourists. There's a lot to learn about our turtles and Sri Lanka is the perfect place to get involved. This program started in 1988 with the aim of monitoring local sea turtle activity and conserve the local nesting sites. The goal was to make the public more aware of sea turtles and just how important it is to help protect them before it is too late. One of the most important activities of the program is its hatchery. Within the sanctuary of the project, eggs are collected and rescued and brought to a location to hatch safely away from predators before being released into the sea at night time. The hatchery program is designed to maximize the number of hatchling reaching the sea and surviving through the critical stages of their early life. Only a few hatchlings' from each batch will ever make it to adulthood. Therefore every nest, every egg, every hatching and every turtle is crucial to the survival of the species. Unfortunately, sea turtles face many dangers. Each year on average, the team helps clear and maintain local beaches, protects vital nesting-grounds, and releases 10,000 hatchlings. When you consider how long the project has been going, you can understand the impact it has on our oceans and maintaining the sea turtle populations. For those who remember Tsunami tragedy in December 2004, Sri Lanka was hit hard by a sub-sea earthquake registering 9.2 on the Richter scale. Most of the area where this program was established was devastated by a 6 meter wave which surged some 1.5 km inland. There were many casualties in the disaster, homes and property were destroyed and thousands were displaced. Thankfully enough, the local man that started the program and his family were fortunate enough to escape with their lives. His home and the turtle conservation however was washed away along with some 200 Hawksbill turtles which had been in their care at the time. There were fears that the destruction of the sea turtle nesting grounds would have a permanent effect on turtle populations. Thankfully, the facility was re-built in 2005 and the focus was for volunteers to help rehabilitate the devastated beaches in order to attract sea turtles again. 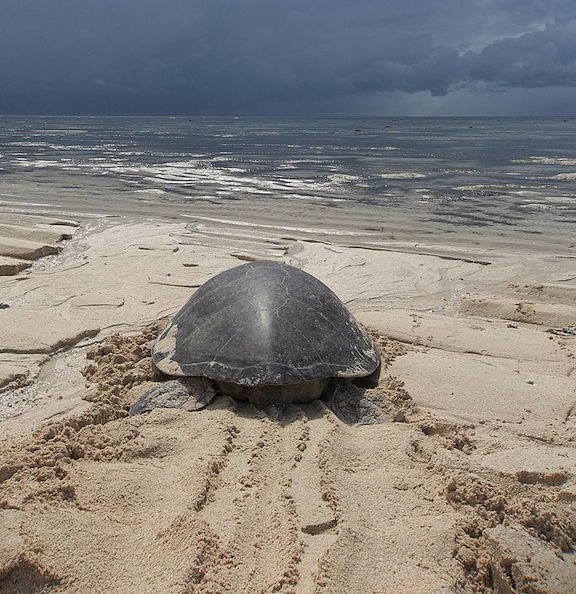 Together with local people and tourists, sea turtles have fortunately returned to the beaches of Sri Lanka and this particular area remains one of the most important sea turtle nesting sites in the country. With our help, sea turtles will continue to return to the beaches every year and its up to us to help do our part to ensure the survival of these magnificent creatures continues. Program Fee – airport pickup/transfer (available from Bandaranaike International Airport only), project orientation, program supervision, accommodation (private or dormitory style) and meals during volunteer program period, in-country 24/7 volunteer support and in country administration costs.